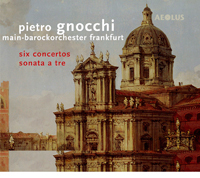 PIETRO GNOCCHI (1689-1775): 6 Concertos for Strings and Continuo, Sonata seconda a tre (First Recordings). Description: These represent half of the extant concerto compositions of Gnocchi, a Brescian who was also a significant Classical historiographer and epigrapher. They are actually concerti grossi, in Venetian style but tempered by the conservatism of his home town - not too strange and not too staid. Main-Barockorchester Frankfurt; Martin Jopp.